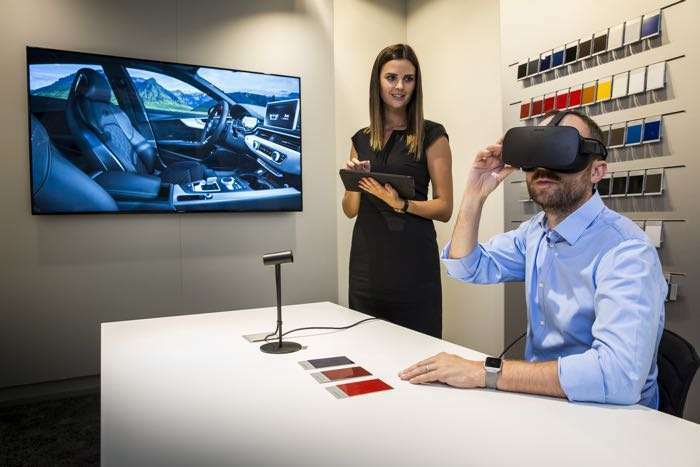 Audi has announced that it is launching its new Audi VR Experience in its dealerships in the UK. The car maker will let its customers use a VR headset to check out their digitally configured Audi in VR. Audi first introduced this new VR feature in Germany and now the UK and Spain are getting the feature, which is designed to give their customers an idea of what their new vehicle will be like. With the VR headset, prospective buyers can configure their individual dream car and explore even the smallest details from an extremely realistic perspective, selecting from several hundred million possible models and equipment variants. The VR application allows users to become completely immersed in the virtual world, conveying an all-encompassing, detailed image prior to the purchase decision. The configured Audi is experienced in three dimensions and 360 degrees, with all light and sound effects. Various environments, times of day, and light conditions also contribute to the true-to-life virtual experience of sitting in the car. The interior can also be observed from every perspective, down to the surface of the decorative inlays, depending on the position relative to the virtual light source. Audi are using the Oculus Rift headset in many countries to run their new VR customer experience software.